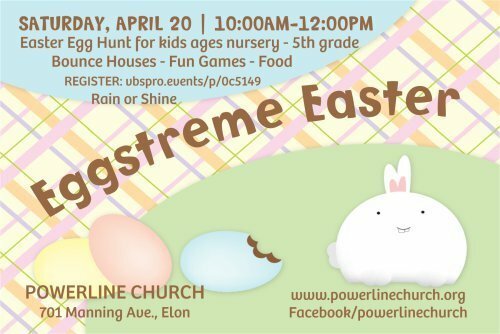 You won't want to miss EGGstreme Easter this year!! Everyone in the community is invited to join in this FREE family event on Saturday, April 20th from 10:00AM-12:00PM! There will be bounce houses, fun, face painting, a story, a meal, snow cones and an Easter Egg Hunt. Stop by our Easter Photo Booth to take pictures of your children with the Easter Bunny. Rain or Shine.